Under the Stars and don't know where to look next ? 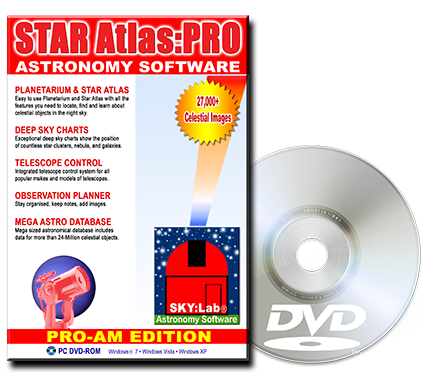 STAR Atlas:PRO's integrated Observation Planner collates and plans your observations in advance, saving precious time and keeping you organized, when it comes to observing under the night sky. Create your own list of celestial objects that you would like to observe and then when you are ready to observe, the Observation Planner displays on sky charts or lists which of your "target" objects are currently visible in the night sky. Adding objects into your Observation List is as simple as pointing and clicking on any astronomical object that appears on a chart, or you can use the Astronomical Database Manager to locate any object of choice and then add it to the Observation Planner. As you wander the Sky using the DSS Virtual Sky Interface, you may come across interesting celestial objects and then automatically have the object and it's data entered into your personal Observation Planner, so the next time your under the Stars, STAR Atlas:PRO will remind you to look for it, charts it's location, and even send your telescope slewing straight to it. You can print the Observing List, export it to a HTML Web Browser File, save it on disk, and of course keep your own observing notes along with each entry.